The National Institute for Bioprocessing Research and Training (NIRBT) is a global centre of excellence for training and research in bioprocessing. NIBRT is located in a world class facility in Dublin, Ireland. This facility is purpose built to closely replicate a modern bioprocessing plant with state-of-the-art equipment. Our clients include a large number of leading biopharmaceutical companies which send their employees for training in both theory and practical settings. During our practicals we demonstrate a wide range of instruments and equipment from various suppliers. NIBRT received a 100mm Evolve™ column for our own use and also training purposes. There are a number of features of the column which were of interest to us and our clients. The promise of ease of use, a good price and the single use approach would be key selling points for many in the industry. NIBRT contains a dedicated downstream suite where we installed the Evolve™ column. The column came complete with operating manual, tool kit, connection kit and a full set of spare nets and seals. The column was assembled and connected to our chromatography skid. The column was trialled using a Protein A resin as it is our first chromatography step which purifies our product through affinity chromatography. The best methods of expressing the efficiency of a packed column is in terms of the height equivalent to a theoretical plate (HETP) and the asymmetry factor (As). These values are easily determined by applying a sample of 2% (v/v) acetone solution to the column. We found the Evolve™ column performed as good as rival columns already present in NIBRT. When considering a column to purchase we would have many positive things to say about the Evolve™ process column. It is user friendly with ergonomic elements, the performance is comparable to more expensive columns and the single use aspect of replacing all wetted components, compared to lengthy cleaning cycles is welcome. 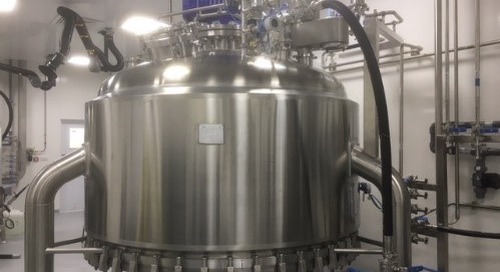 As biopharma is moving away from equipment that has a high initial cost and needs costly validated cleaning cycles to single use technology, the Evolve™ process column certainly requires consideration. It has generated interest from trainees on site and we foresee its continued use on our training programmes. for more information on NIBRT please click here. Evolve™ is a trade mark of Delta Precision Ltd.